Entered the Navy in 1778 as third Surgeon’s mate, receiving his promotion to Surgeon on 9 October 1780, aged 23. He held Surgeon’s appointments in numerous Naval ships until being appointed Surgeon-General of the expedition to Botany Bay under Captain Arthur Phillip: his salary was £182.10s a year. White had three Assistant Surgeons, each on half his salary. A hospital built on the west side of Sydney was described by White as very good. 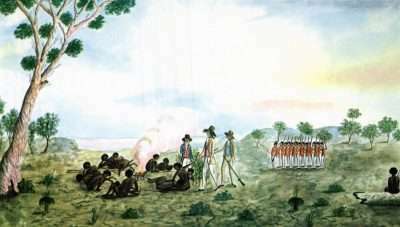 White developed an interest in the local fauna and flora of New South Wales, and was involved in many exploratory journeys of the country side and encounters with Aborigines. White sailed for Europe in the Daedalus on 16 December 1794, taking his infant son Andrew Douglas White by convict Rachel Turner with him. His Journal of a Voyage to New South Wales, with illustrations of topographical and natural history subjects, was published in 1790. A reprinted hardcopy was published in Australia in 1962. Thomas ARNDELL (1753-1821). Made the voyage to NSW on Alexander, serving at Port Jackson under Surgeon White. He was sent as Assistant Surgeon to Norfolk Island by the Atlantic in 1791. He was appointed Principal Surgeon at Port Jackson when John White returned to England in December 1794. 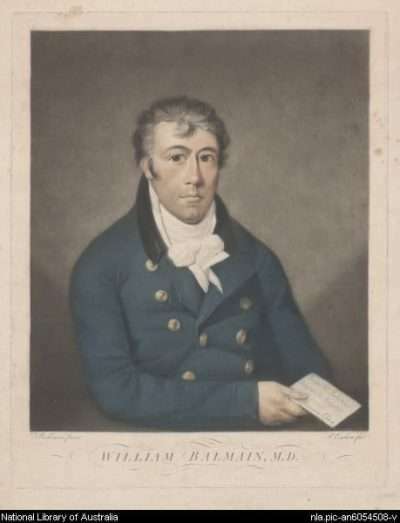 William BALMAIN (1762-1803). Made the voyage to NSW on Alexander, serving at Port Jackson under Surgeon White. He was sent as Assistant Surgeon to Norfolk Island by the Atlantic in 1791. He was appointed Principal Surgeon at Port Jackson when John White returned to England in December 1794. Denis CONSIDEN (?-1815). Travelled with the First Fleet on the transport Scarborough; at Port Jackson worked in the hospital. He also worked on Norfolk Island from March 1789 to October 1791, then back in Port Jackson until his return to England in 1793. He continued his studies and graduated as a doctor of medicine in 1804, basing his thesis on his discoveries of eucalyptus oil. John Turnpenny ALTREE was to have served on Lady Penrhyn as Surgeon to the convicts, but was replaced by Bowes Smyth to whom he acted as assistant. John Altree accompanied Phillip Gidley King to Norfolk Island as Assistant Surgeon. Arthur BOWES SMYTH (1740-1790). Bowes Smyth was engaged as Surgeon to the Fleet, but finding Surgeon John Altree assigned to care for the convicts aboard Lady Penrhyn was ill, Bowes Smyth undertook the charge of the women prisoners. He returned to England in August 1789. James CALLAM had qualified as a Surgeon in the navy in 1779. He joined HMS Supply as Surgeon on 2 November 1786 and was on Supply when she was sent to Norfolk Island on 14 February 1788. While on shore in 1790 at Port Jackson, Callam had a farm beyond the Brick fields. When he was discharged from Supply at Deportford England on 8 May 1792 he had served aboard for five years. Thomas JAMISON (1745-1811). Jamison joined HMS Sirius as Surgeon’s First Mate; went by HMS Supply to Norfolk Island with the first group, returning to Port Jackson in February 1791. The next month he was discharged from HMS Sirius and appointed Assistant Surgeon to the colony at Norfolk Island. With John Altree, Jamison looked after the medical needs of the people at Norfolk Island, until he returned to Port Jackson by Supply in 1791. He was later Acting Surgeon in Port Jackson in the absence of William Balmain. George Bouchier WORGAN (1757-1838). Entered the Navy in 1775, qualified as a Surgeon’s Mate in 1778, as a Surgeon in 1779, and was gazetted as a Naval Surgeon in 1780. He served on HMS Sirius from 1786 to 1792 and is noted for having taken his piano with him on Sirius for the voyage. This was left with Mrs Macarthur.